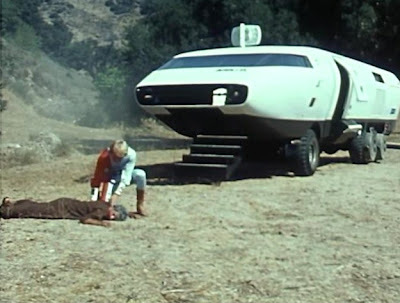 “Omega” is one of those more-interesting-than-usual installments of the 1970s Filmation Saturday morning series Ark II. The reason that this episode is more intriguing than most segments is that it -- like “Robot” or “The Lottery” -- features a specific science fiction concept other than just the one featured in the premise; that of a post-apocalyptic world. In this case, that concept is a villainous, sentient super-computer, a Colossus for the Saturday morning set. Here, the Ark II team runs afoul of perhaps the most powerful nemesis it has yet grappled with: a super computer “built by a society that no longer exists.” The super computer -- re-activated in a primitive village three weeks earlier -- is called a “checkpoint” device, model “Omega.” And, in addition to its other functions, the machine can easily dominate and control human minds. 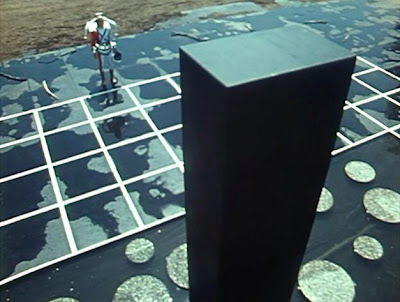 Visually, Omega resembles the Monolith from 2001: A Space Odyssey (1968). 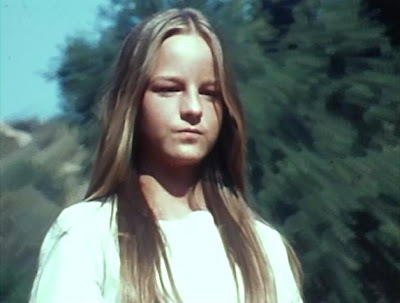 As the episode begins, a kindly grandfather (played by Harry Townes), realizes that his daughter Diana, portrayed by a very young Helen Hunt, is now under the control of Omega. Thus, Jonah and his team set out to de-activate the machine and free her from machine enslavement. Unfortunately, Omega proves so powerful that Samuel begins to fall prey to its commands too. He rejects Jonah as leader and serves Omega instead. Jonah attempts to defeat the super computer by executing a series of “chess” moves designed to destroy the device. Finally, even that strategy isn’t enough, and Jonah himself nearly succumbs to the machine’s wishes. Finally, it is Adam the chimpanzee – whom Omega has derided as some kind of strange animal – who is able to pull Omega’s plug. After the computer is defeated, Jonah notes that Omega will never again be able to impose “de-humanizing ideas” upon mankind. Specifically, he’s referring to the idea that Omega has made all the elders of the local village the slave to youngsters, like Diana. As Omega reports early on, “young minds are quicker” to accept him. I enjoyed this episode of Ark II, because drama works better, in my opinion, when heroes are outmatched or over-matched by villains. And that’s the case here. 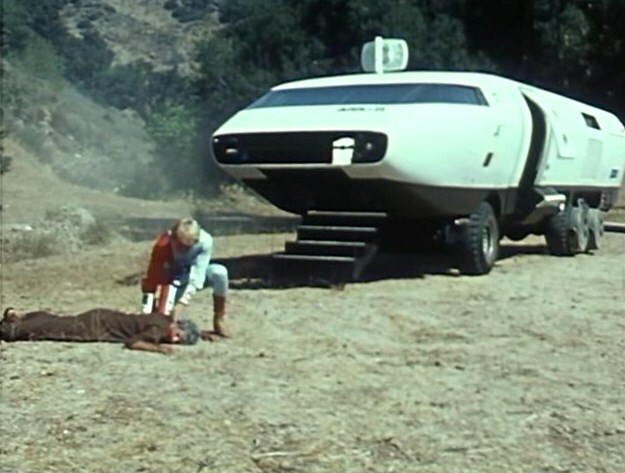 The high-tech Ark II crew is nearly defeated by the high-tech machine. Omega thus proves a powerful and insidious force and infuses the episode with a welcome sense of menace. I also enjoyed seeing Harry Townes play a crucial role here -- as a fearful would-be-slave of a super computer -- since he played a similar character in Star Trek’s “Return of the Archons” back in the mid-1960s. "Omega" is a brilliant ARK II episode for all the reasons that you have stated. I too enjoyed seeing another advanced piece of future technology rivaling the Ark II.